My mind has been on other things than blogging recently, sorry. Tuesday slipped away like water through my fingers and I completely forgot to post this picture. This is Enceladus, one of the lesser moons of Saturn, photographed by Cassini. 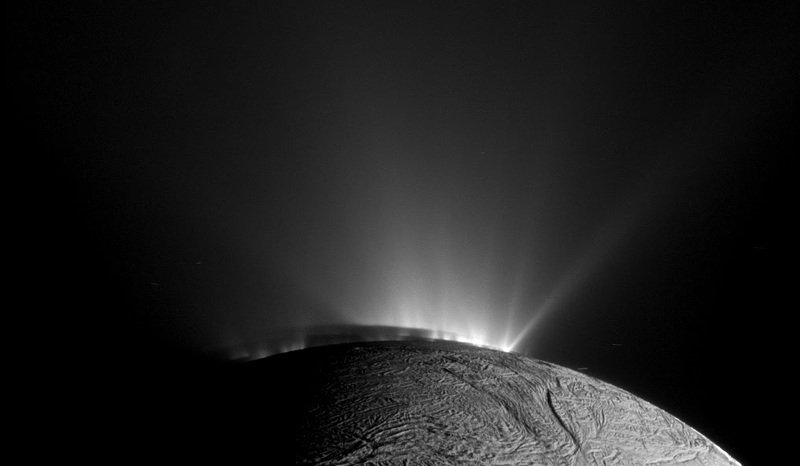 Those plumes are geysers of water and ice lit from behind by the sun. Scientists are fascinated by these plumes, and think that there may actually be liquid water, maybe even a subsurface ocean, on this moon, in a neighborhood where everything else is frozen solid. I'm more interested in the wrinkly textures of the surface, which look like a scuffed and scarred piece of old wood.